Alex Vryzakis and former professional referee Mark Halsey from youaretheref.com run the rule over the the latest batch of controversial decisions from the second weekend of the new Premier League season. Penalties tend to be football’s way of separating the wheat from the chaff, the strong referees from the weak. Mark Clattenburg managed to embody both at the King Power Stadium this weekend, despite Claudio Ranieri’s gracious attempts to deflect the blame. It started off well when Danny Drinkwater went tumbling in Arsenal’s box. After a desperate Petr Cech saved Jamie Vardy’s shot, Drinkwater appeared clear to shoot on goal, were it not for Laurent Koscielny. Replays showed the French defender’s last ditch tackle mostly got the ball, and Clattenburg’s choice to deny the penalty was a correct one. Late on however, Clattenburg wasn’t quite so lucky. As Ahmed Musa drove towards goal, Hector Bellerin appeared to catch him from behind ensuring a definite penalty decision. Yet again, play was waved on. After the dizzy heights of a great catch with the Drinkwater decision, Musa was denied a nailed-on pen. Wheat or chaff? Not sending off Francis Coquelin for a second bookable offence may well tip Clattenburg into chaff territory, for this week at least. Grade: B-. A topsy-turvy performance from a referee used to scrutiny. I thought Mark refereed the game very well, I thought the first penalty shout was a fantastic decision. Mark had a great view of it and you have to say outstanding decision. But then you look at the late penalty and once again Mark is in a superb decision to see the foul and my first impression was penalty. All you can think is Mark thinks Musa has initiated the contact but in my personal opinion he got that wrong and it was a penalty to Leicester City. Stoke’s clash with Manchester City this weekend allowed fans to see the new Premier League refereeing directive in action. While last week saw Kevin Friend setting an excellent precedent, this week was Mike Dean’s turn to prove himself. First up was a penalty given to Man City after Ryan Shawcross clearly pulled back Nicolas Otamendi as the ball was looped in. Shawcross is known for his antics in the box, and the penalty was a timely reminder that such shenanigans will no longer be tolerated after the summer’s overhaul of refereeing directives. At the other end of the pitch, Dean then gave a penalty to Stoke after adjudging that Raheem Sterling had impeded Shawcross from jumping for the ball. It appeared a soft decision, but an understandable one considering his new marching orders. The problem for Dean really lay in the penalty not given. After Phil Bardsley’s volley was saved, a clumsy Aleksandar Kolarov shoved Joe Allen to the floor. The incident was as clear a penalty as you’ll ever see, and it was an unfortunate blot on an otherwise impressive refereeing performance by the often much-maligned Dean. Grade: B. Would’ve been a brilliant performance had Dean given all three penalties and been consistent in his decision-making. As I understand it there has been NO directives issued to the referees, whatever Chris Foy has said to the clubs we don’t know but holding and pulling has been discussed a lot. Last season there were instances where players were grappling and no action had been taken, that’s what we’re trying to get at and we want to penalise the right offences. You can support Mike Dean’s first decision but he wasn’t pro-active, he should have spoke to them beforehand and then let the corner happen. If it still happens then you can say they can have no complaints because they’ve been warned. It’s very important we pick out the right decisions, I don’t think there’s been any new directive to any referee at any level so what are the PGMOL management telling them? Are referees going out and doing things their own way? How many games at the Euro’s were we discussing referees? They were excellent yet two weeks into the new Premier League season and all we’re talking about is referees. Take the Raheem Sterling incident, there’s nothing in the laws to say you have to be looking at the ball. Sterling is doing his job, it’s a contact sport and there’s minimal contact, he doesn’t impede Shawcross one bit and Shawcross even admitted himself he didn’t think it was a foul. It will be very difficult for the referee that goes and takes charge of Stoke this weekend, they’ve got meetings at St. George’s Park this week and I’ll bet they’ll be telling Mike Dean that wasn’t a penalty against Raheem Sterling. Mike Riley could come out in the press and say this was a penalty for that reason and this wasn’t a penalty for one reason but he won’t come out and talk to the media. 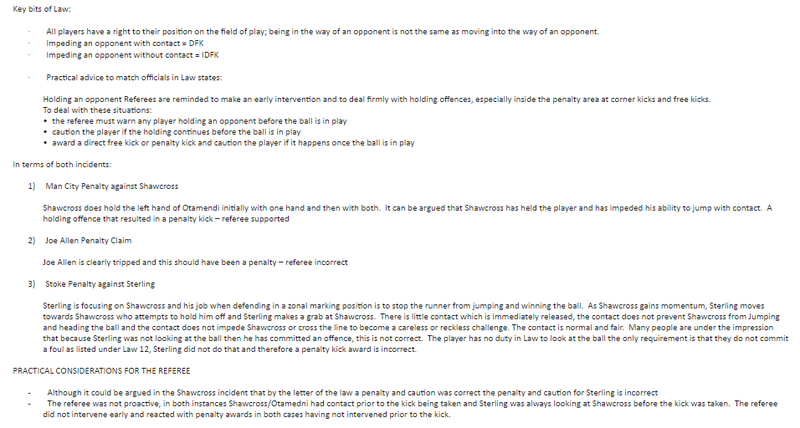 I’m saying the Shawcross foul on Sterling has never been a penalty and never will be, out of the three the most blatant penalty was Kolarov on Joe Allen but Mike Dean’s position was too detached from play to see it. You’ve got to look at the assistant too, he’s right there and he’s missed it. You would be forgiven for thinking referees in England had caught onto Diego Costa’s game. Week in and week out, the Spaniard manages to get away with the most outrageous incidents, laughing in the face of the law. Saturday’s game against Watford was no different. After Chelsea’s lackadaisical defence allowed Etienne Capoue to score an incredible goal, beating the flailing Thibaut Courtois at his near post, Costa decided that berating the referee would be a good use of his time. Instead of learning from past mistakes and keeping his mouth shut and his head bowed, Costa ended up with a telling off and a booking to boot. Had he now learnt his lesson? Of course not. Soon afterwards, Costa was at it again. This time however, it was Jon Moss who faltered. As Chelsea stormed forwards, Costa ended up in a heap on the ground just outside of the box. Replays showed that he had obviously – and theatrically – dived over the unsuspecting Miguel Britos. Though Moss waved play on and did not give the foul Costa so craved, he did not book the Chelsea forward either. Had he done so, he would have had to send Costa off. The dive was so ostentatious it’s hard to understand what Moss was thinking, and considering that Costa went on to score the winner, he should be ashamed of his decision. To top it off, Watford’s Craig Cathcart clearly handballed in the penalty box late on in the game, and yet nothing was given. Not a good day in the office for Moss. Grade: C-. Too many erroneous decisions at such a high level. You look at the Chelsea vs West Ham game and he was booked rightly for dissent by Anthony Taylor but I didn’t think Taylor had the best of games. He was very inconsistent for a referee of that standing and he cautioned a couple of players where he could have managed things better. Then the worst challenge of the game from Costa and he didn’t show him a second yellow card. In the Watford game it was the same again, I’m a great believer of managing the game but when dissent is open you can’t manage that. We saw it with Harry Arter on Sunday and he was correctly cautioned too. Jon Moss on Saturday showed Costa a yellow card for dissent and then there was clearly an act of simulation and Jon Moss was weak, he should have sent Costa off for simulation. Had he not been cautioned already I think he would have booked him but it’s about being brave and not being weak. Take a look at Craig Pawson on Sunday, he’s cautioned Harry Arter and rightly so and then he’s shown him a second yellow for a foul late on. That’s what you have to do in those situations. You can see the contact, Clasie has just caught his book and knocked Luke Shaw’s leg onto his other leg. At that speed it’s so easy to be knocked off balance and Southampton can have no complaints that Anthony Taylor has given that as a penalty.